One of the first things most students of economics learn is the diamond and water paradox. How can it be that water is free even though life cannot exist without it, while diamonds are expensive although no one dies for lack of diamonds? The answer is that water can be free if its supply is abundant relative to demand. Nevertheless, it is abundantly clear that worldwide, the demand for water outpaces supply. This imbalance is the clearest sign that water is underpriced. Yet, many governments are reluctant to price water like other goods. In a recent study, we have examined whether this is the right choice. Do governments succeed in protecting their citizens by providing cheap water? On this World Water Day, let me take a closer look at that question. In fact, when you do not get prices right for water, you end up with misallocation of water today and misallocation tomorrow. Misallocation today can take the form of thirst, low agricultural productivity, or worse, poor sanitation, disease, and malnourishment. Misallocation tomorrow can take the form of inadequate investment in infrastructure and the technologies to meet future water needs and ensure water security. All these are important enough to lead to macroeconomic and growth underperformance in economies. The need to “get prices right” can be seen from country experiences around the globe. Take the case of India, where underpricing of water and inputs is contributing to scarcity today and long-term problems that will be hard to solve. Water-related subsidies—through lower prices of diesel and free electricity for irrigation pumps—have led to widespread overuse of underground aquifers and increased salinity of soils, nearly undoing all the productivity gains from the green revolution of the 1960s. Or California, where Governor Jerry Brown implemented an executive order in mid-2014 mandating a 25 percent reduction in water use over the next 12 months compared with 2013 levels. There were many reasons for the severe shortage of water in California, including severe droughts and unprecedentedly high temperatures, but decades of mispricing also played a role. This experience drives home the fact there is a strong role for price incentives in the rationalization of water use. There are numerous other examples from around the world that show that mispriced water leads to what is known as the “tragedy of the commons,” where individual users of a resource acting independently and rationally according to their own self-interest behave contrary to the common good of all users by depleting that resource. This is evidenced by rapid depletion of underground aquifers and a deterioration in water quality. In many countries, public water utilities charge households a price that is just a fraction of what it costs to deliver water, let alone maintain or expand water infrastructure. Calculations by IMF economists suggest that, in 2012, this underpricing resulted in water subsidies totaling about $456 billion worldwide, or about 0.6 percent of global GDP. In some countries subsidies amount to as much as 5 percent of GDP. And this is just the tip of the iceberg, as these estimates exclude agricultural uses of water, which in developing countries constitute the bulk of water consumption. 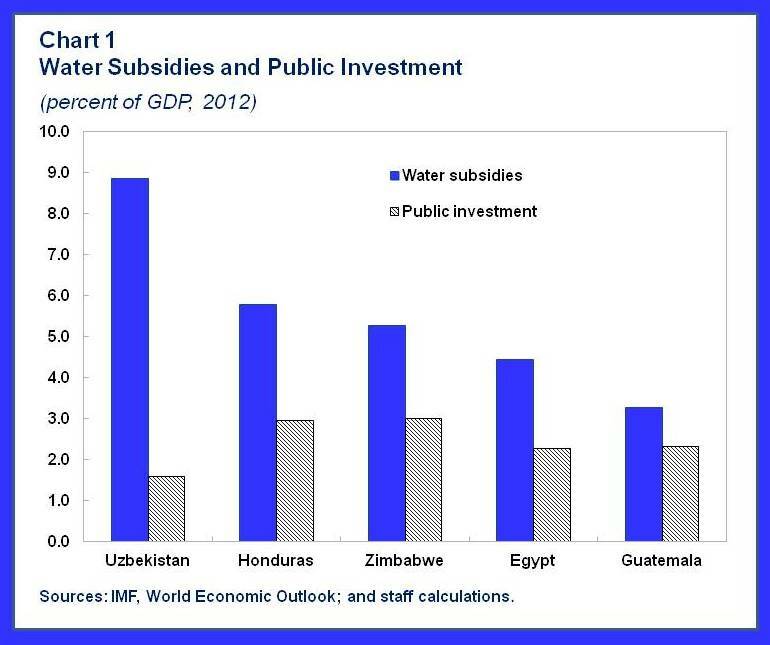 Water subsidies even exceed total spending on public investment in some countries (see Chart 1)—suggesting that other worthwhile expenditures are being crowded out. If not charging for water helped the poor, water subsidies might be defensible. But our study finds that water subsidies are inequitable and do not achieve their declared goal. 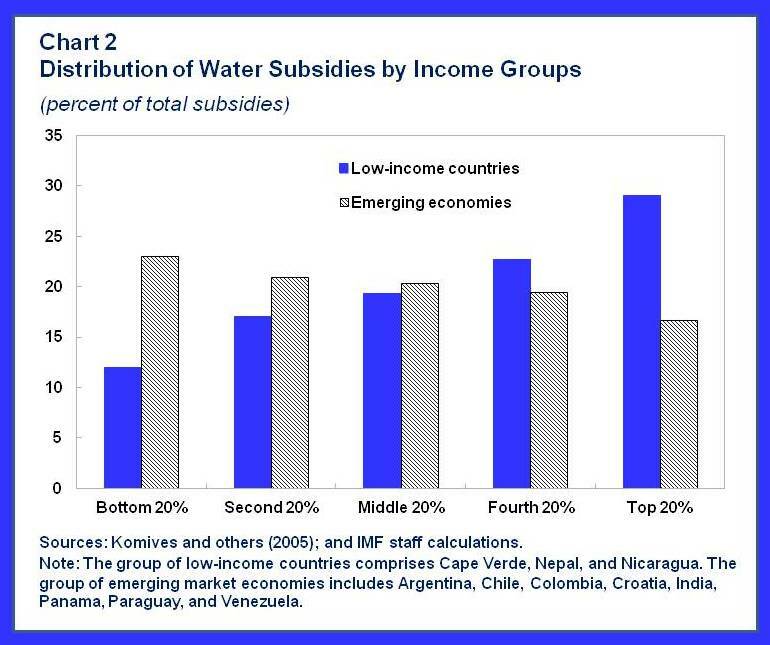 Since the subsidy that one gets is proportional to the water one uses, and since the poor often have limited or no access to water, subsidies in developing countries end up benefiting mostly upper-income groups. In select low-income economies, the richest households get, on average, three dollars’ worth of subsidized water for every dollar’s worth provided to the poorest (see Chart 2). So what is the answer? Achieving greater efficiency in water consumption requires a holistic approach complemented by the reform of policies that drive—directly or indirectly—water use. Governments could put in place regulations that strengthen rights to water access and promote its efficient use, build strong and independent institutions in charge of water management, and conduct public awareness campaigns that help build support for these reforms. Water pricing reform should be an essential component of any drive to improve water management, helping to rationalize demand, improve its delivery, and unlock further supply. Governments need to price water in a way that achieves full cost recovery, including costs of maintenance and investment. They should also design pricing in such a way as to expand water access for the poor and vulnerable. Take, for example, the case of Burkina Faso. The country introduced a progressive tariff grid for drinking water based on the volume of use, with the higher-tier users subsidizing the lowest tier as well as sanitation activities. The public water utility boasts recovery rates of 97 percent, has low debt ratios, and reaps annual profits. Thanks to water pricing reform, access to drinking water has doubled over the past two decades—a remarkable achievement in a country where water is scarce and rainfall highly variable. Why does the IMF care? It is clear that water challenges can have economic consequences, and failure to manage these well can impede a country’s economic prospects. We hope that by studying the economic dimension of the issue, we can shine a light on this important topic. As we have seen with California’s struggles, postponing action is a luxury the world can hardly afford. For more information, see water infographic, and Finance & Development article.